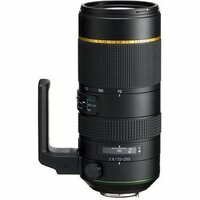 The Pentax 70-200mm f2.8 ED DC AW D-FA* HD telephoto zoom lens joins the high-performance Star (*) range developed for the highest level of image rendition. The lens' versatile zoom range coupled with its bright f2.8 aperture and lens-coating technologies ensure crisp, high-contrast images, even under demanding lighting situations. In addition to four super-low dispersion glass elements and two ED (Extra-low Dispersion) glass elements, its optics includes a pair of new Super ED glass elements to effectively compensate chromatic aberration over the entire zoom range and deliver high-resolution images with edge-to-edge sharpness. Its dustproof, weather-resistant construction also makes it extremely dependable and durable when shooting outdoors.